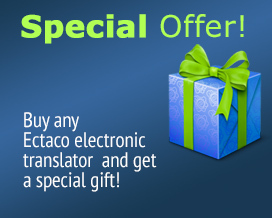 ECTACO Partner XM500 is a unique device which allows translation among any of the included 126 languages in the database be it Spanish to Maori or Samoan to Dutch. The collection includes the most spread out languages in the words, as well as many others, for true lovers of linguistics. Besides the dictionaries, the device offers many extras, which will make your learning and communication more pleasant and efficient.